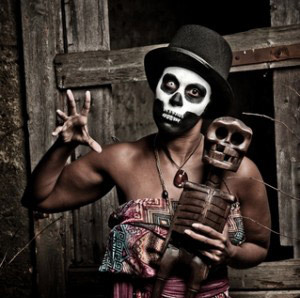 Though many individuals associate the origins of Vodou (sometimes referred to as Voodoo) with those lands in the New World associated with the African Diaspora as a means to cope with the forced migration, really the idea of Vodou formed well before this time period in West Africa. In fact, though most Vodou practitioners reside in Atlantic Islands, namely Haiti, there are still many practitioners in countries such as Benin, Togo, and Ghana. Vodou is an animistic religion, meaning that there is no separation between the physical and spiritual realms. In fact, many Vodou practitioners believe that there are spirits, not necessarily human in form, all around us, who accompany us on our day to day routines. They also believe that not only humans have souls, but all living creatures, even the smallest bacteria. Others go further to say that inanimate natural objects such as rocks and water as well are spiritual entities, and possess a life form unbeknownst to us. Nearly a quarter of individuals in certain West African nations such as Benin remain loyal to this animistic faith. Patterns of worship follow various dialects, gods, practices, songs and rituals. Vodou recognizes a single deity often referred to as Orishas, though Orishas has many helpers to do his work. A single divine Creator, called variously Nana Buluku is an androgynous being that in one is said have given birth seven children. Each of these children was given the power to rule over a predominant aspect of nature. These include parts of animals, earth, and sea. The creator embodies a dual cosmogonist principle of which Nana Buluku is the female moon, and Lisa is the male sun. Nana Buluku's youngest child, Legba, was to remain with her and act as the liaison between herself and her other six children. Though in Haiti, he is an old man, in West Africa, Legba is young and athletic. Eshu is a messenger deity who relays messages between the human world and the world of the Orishas. He is the mediator between the gods and the living, and thus he maintains harmony and communication. He is depicted as a dark, short man with a large staff and often a pipe, candy or his fingers in his mouth. All creation is considered divine and therefore contains the power of the divine. This is how medicines such as herbal remedies are accounted for, and explains the prevalent use of mundane objects in religious ritual. 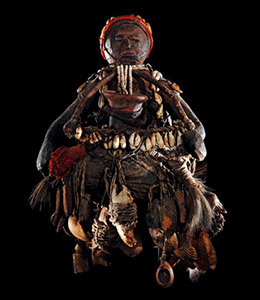 Voodoo talismans, called "fetishes", are objects such as statues or dried animal parts that are sold for their healing and spiritually rejuvenating properties. Have you had any experiences with any forms of Vodou? What are your feelings towards this ancient and mysterious practice? If there is anything that you would like to know about Vodou, 7witches Bokor Jean-Baptiste Sylvestre would be happy to answer your questions. are there any spells to ruin a person who has lied and stole from you and send them back to where they were born? And make them pay you back every penny they owe, then send them away? And not have it come back on you?